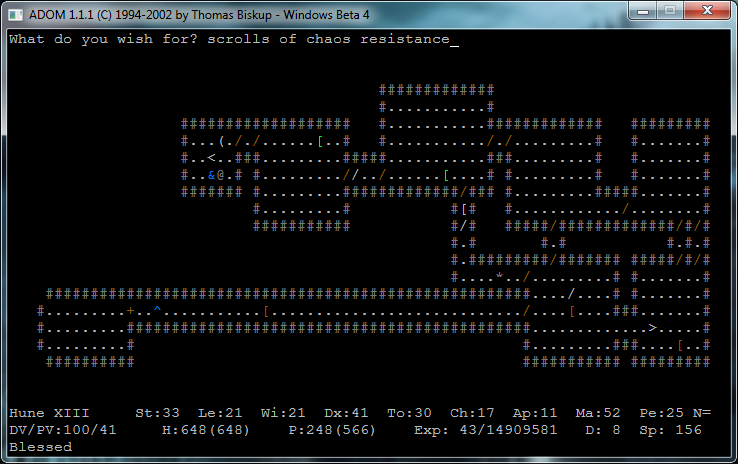 I've been trying to beat ADOM with an assassin every now and again over the past few years. A week ago I started trying once again, maybe more seriously than ever before. And last night I finally won, with the 13th character of this particular series of tries. I've won ADOM previously with a dark elf elementalist (and maybe a gnome aswell, can't remember) and a gray elf archer. It's been years, though, and I've yet to meet Andor Drakon without cheating; I just go for the easiest victory. This time was no exception and I just headed for closing the portal. I did close the portal pretty cowardly, though; I cleared only the side rooms, handled the levers and used a wand of destruction on them, and then left without killing Fistanarius and most of the other balors. This was because my character didn't feel powerful enough -- character level only 38 upon arrival. I usually still ascend back to the surface after getting the Mana orb but this time I went straight to close to portal. I was pretty heavily corrupted and I was running low on scrolls of chaos resistance. I wanted to be clean of all corruption when finishing to get a happier ending (thus saving the unicorn quest) so I hurried to close the portal. After doing that I stayed around to get the twin daggers, the Trident of the Red Rooster, and other stuff. After succeeding in the main goal, I managed to get seven rings of djinni summoning from dipping rings into potions of exchange, and I did get the weird tome so I actually wasn't that bad on SoCR in the end. It was maybe a slightly hasty victory but a victory nonetheless. your age. You always were a natural leader and the center of interest. You decided to become an Assassin. knows. He returns to his lands victorious and is hailed as a great leader. people, allowing his people to prosper and grow. and became a great ruler while saving himself 8 times. He scored 19812264 points and advanced to level 47. Hune XIII visited 135 places. His strength score was modified by +20 during his career. His learning score was modified by +16 during his career. His willpower score was modified by +13 during his career. His toughness score was modified by +20 during his career. His charisma score was modified by +11 during his career. His mana score was modified by +12 during his career. His perception score was modified by +11 during his career. He was unnaturally aged by 92 years. 8466 monsters perished under his attacks. the heavy crossbow "The Far Slayer"
the jet-black battle axe "Executor"
the medium obsidian shield "Protector"
He was fire resistant (enhanced through items). He was poison resistant (enhanced through an item). He was cold resistant (enhanced through items). He was lucky (enhanced through an item). Fate smiled upon him (enhanced through items). He was shock resistant (enhanced through items). He was able to see invisible things (gained through an item). Shot, Lightning Shot, Miser, Quick, Quick Shot, Treasure Hunter, Very Quick. He had a final speed score of 160 (final base speed: 144). He was a messiah of Anssaria. He asked for 2 divine interventions.